... on the other hand, there is our location Boxberg near the A utobahn A 81 from Würzburg to Stuttgart. That is 600 m² (5,458 square feet) bonded area for large equipment especially machinery, equipped with double claw crane having a lift capacity up to 32 tons. 5 warehouses used for short-term storage, transshipping of goods/cross dock and unique dimensional merchandise. The total storage area at this location equals 6,300 m² (68,000 square feet). Special lifting equipment of all kind designed for handling goods not suitable for standard pallet dimensional skidding. 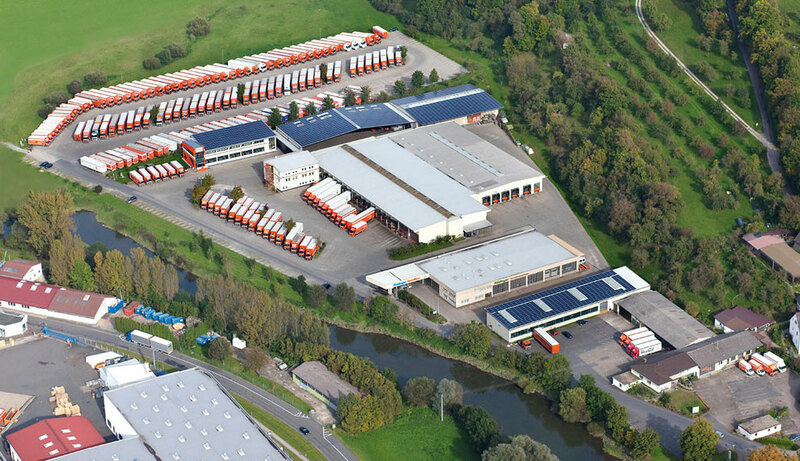 Headquarters and warehouses of Rüdinger Freight Forwarder in Southern Germany. Each building is equipped with protective insulation and therefore relatively stable in temperature having a fluctuation in temperature of maximum 1-degree centigrade. ❱ 2,000 m² (21,500 square feet) block storage including 6 docks for loading and unloading. ❱ 1,750 m² (19,000 square feet) block storage including 8 docks for loading and unloading. ❱ 2,400 m² (26,000 square feet) block storage especially designed for machinery. ❱ Overhead crane with 2 claws, which have a combined capability of 35 tons, clearance of hooks is 8 meters (26 feet). ❱ 2 docks for loading and unloading. ❱ 1 gate 6 meters (19.6 feet) and 1 gate with 3.5 meters (11.5 feet) high. 600 m² (6.450 square feet) of this facility are customs bonded area. ❱ 3,300 m² (35,500 square feet) block storage especially for storing machines. ❱ Overhead crane with 2 crates, which have a combined capability of 25 tons; high of the hooks: 8 meters (26 feet). ❱ 4 docks for loading and unloading. 1 ground level gate with 6 meters (19.6 feet), 1 gate with 3.5 meters (11.5 feet) in height. ❱ High shelving of up to 700 pallet capacity. 2 docks for loading and unloading. ❱ High shelving of up to 1900 pallet capacity. ❱ 700 m² (7,500 square feet) pick and pack area. 3 docks for loading and unloading. For your convenience – you don't have to scroll to locate the warehouses – this photo is displayed a second time. ❱ High shelving for up to 3,500 pallet-storing positions; the pallets can be stored using a reach-forklift in the high-bay racking. ❱ 500 m² (5,400 square feet) picking area. 3 ramps for loading and unloading. ❱ 600 m² (6,400 square feet) block storage at ground level. 1 gate with 6 m (19.6 feet), 1 gate with 3.5 m (11.5 feet) in height. This warehouse is leased out on a long-term lease to a customer. ❱ High-shelving including up to 4,300 pallet positions. ❱ 3 docks for loading and unloading. The pallets can be stored using a haulers-forklift designed for high shelving. ❱ High-shelving capacity 8,000 pallet positions. The pallets can be stored using a VNA-forklift designed for high shelving. We promised to make it easy for you: Same picture for your navigation a third time – the warehouses of Rüdinger Freight Forwarder Germany at Boxberg. This location construction started in 2013, presently 3 facilities are already in use. These warehouses can be utilized for both high-shelving and block storage. Additionally, there is a pick & pack area. The total storage-area per each building is 2,880 m² (31,000 square feet). Meanwhile, there are five warehouses in Dörzbach.